American Flag Pallet - GNH Lumber Co. American Flag Pallet - GNH Lumber Co.
Do you love the American Flag? 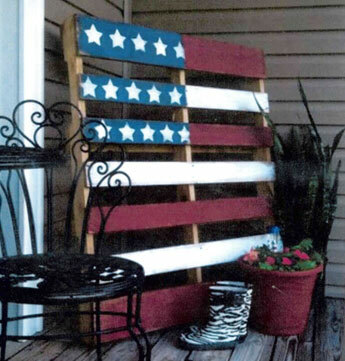 You can easily make a very nice flag from a wood pallet. 1. Cut the pallet in a little if you want to have a more flag shape, or leave it whole like this one! Pallets come in all shapes and sizes, so cut it how you want. 2. Fill in any holes or damages with the wood filler, sand it with an orbital sander, or leave it rustic if you like. 4. Using the blue painter’s tape, tape off the blue stars part of the flag and the white stripes. 5. Paint the red stripes. 6. Take the tape off the blue section and paint it blue. Let it dry overnight. 7. Print out a picture of a Star and cut it to create a stencil. Paint the White stars over the blue area.